ROAD TOWN, Tortola, VI- Calls flooded our newsroom today June 28, 2017 as yet another Government Department was forced to close their doors, for the day at least, due to poor working environment. 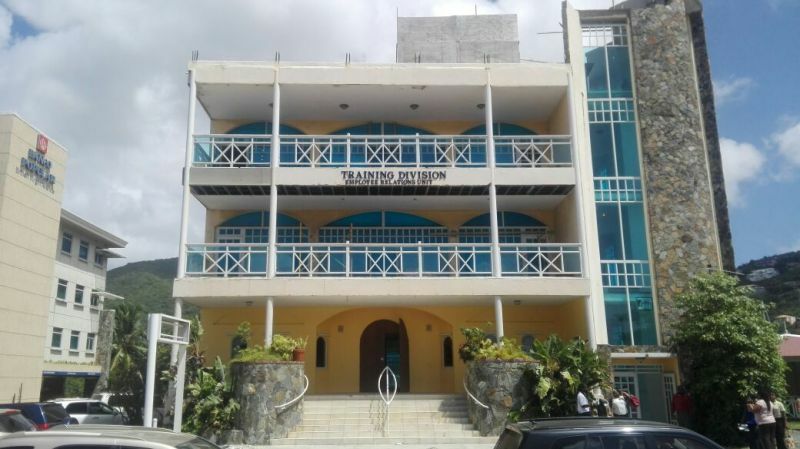 The Training Division, which falls under the Deputy Governor's Office, and is located in the Betitto Frett Building across from the Central Administration Complex, is now closed because of reported sewerage issues. Senior Officials at the Government Human Resources Department are tight lipped on the issue and it is not clear when the Department will resume normal business. An internal Email forwarded to our newsroom also confirmed that the Training Division was closed "until noon"; however, up to publication time the office was still closed for business. 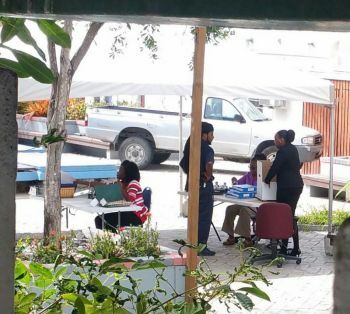 It was just on Monday June 26, 2017 that our newsroom reported that the High Court Registry was working from under a tent in the middle of Road Town due to poor office conditions. Civil servants have often complained about the poor working conditions for the past six years plus, including issues of mold in buildings, lack of adequate space, funds for their department’s projects and human resources to carry out policies. 'Government' is too big; it's high time to downsize. That moldy building they call college need closing also . Up there is a silent killer soon and very soon we will see the result from the moldy place. What does the training division do? Not commenting on this site as I do not have any details on the issues. However, what I do find alarming is how we see to have a culture of not maintaining much. We tend to get the best of everything initially, but have horrors with the upkeep after the 'newness' wears off. Attention is usually raised only when something has gone really bad. A vehicle can last for years if it is serviced regularly. Air condition does not have to reach to mold alert if they are serviced and cleaned regularly. and the list goes on. soooooo how is this the government fault or is it the landlords fault for being a slum lord? These people are insane who still support this government. Those who support are brainwashed. We suffering under NDP! Lawd! Hear Our Cries! Lawd! We Need A Change Now! Lawd! We can't wait two more longgggg years. Lawd! pleaseeeeeee.....! Hear Our Cries!!!!! The governor needs to force the NDP to dissolve their government and call for an early election. We badly in need of a team who can get the job done. He should not leave this mess for the other governor to clean up, since this could be partly his fault and may have possibly been the case if he had called for a COI into the "alleged" mismanagement of the Pier Park Budget. Instead we now find ourselves in object unneccessay suffering all around. Civil servants are quietly suffering just to hold on to their little pittances to survive. It shouldn't have to be this way governor. I looked at vino cartoon before reading about yet another disaster experienced again on these poor government workers by their top bosses, and I must say, even done-deal looks like he's stressed-out and ready to cry-out. His face alone revealed how pass overdue he feels he is soo ready for yet another one of those globetrotting trips to save the world's environment, when he just needs to look around and face it up close and center and witness everything falling apart under he and his team's watch. @Welmaboi. Don't forget the wall and that airline deal too. Those NDP have been involved in too many wrong dealings. NDP just not ready for tis ting. ...for the government, any government worth its salt to STOP renting from private landlords (hoping for an ROI in the form of votes come election time) and to build a proper GOVERNMENT CAMPUS. Even smaller, satellite branches where government services can be accessed from East End to West End, Virgin Gorda, Jost Van Dyke and Anegada. That would be Phase 1. In tandem with this phase should be a SOLID plan for maintenance of the facility for the LIFETIME of the facility. A proper Facility Maintenance Unit with staff trained to routinely maintain and service the government facilities and to manage them properly would be essential here. Phase 2 would be to investigate where Remote Working technology can reasonably be used. Again, the primary aim should be service delivery to the public and making this as accessible and as seamless as possible. This is where many other nations are heading with their Public/ Civil services. It is no use waiting to be behind the curve. Let's catch the wave on the crest. Remote working of course relies on being able to trust your staff to do what they must do without you hovering over them or them putting in 'face time' but the reality is that if you can't currently trust them to do what they have been hired to do, then why are they still in your employ? Let the Public Service be about serving the public and let the staff and the customers of this territory ALL have facilities they can be proud of. They don't care about us. Who is the land lord? The Training Division, which falls under the Deputy Governor's Office, and is located in the Betitto Frett Building. Every employer has a moral obligation to provide a safe and healthful working environment for employees. Employees is one of the most valuable resource in a business, agency, public sector........etc. But too often they are taken for granted and not treated with the respect, attention and support they deserve. Other resources often take precedence over employees. However, nothing gets done without employees. Fior example, anyone ever see a well-crafted policy do any thing on its own; it takes employees to implement the policy. Moreover, was the sewage problem a sudden failure of the sewage system or was it a result of operational neglect? Who is responsible for maintenance and operations of the leased space? Is the lease a triple net lease, i.e. the leasee is responsible for maintenance and repair, capital improvement, taxes, utililities, insurance......etc for rental square footage? If so it is a sweet deal for the lessor. Nevertheless, government still has the responsible for providing a safe and healthful working environment for employees. Employees life, health and safety must come first. This is an integral part of the contract between government and employees. The apparent culture of running facilities to failure and poor facility management need urgent action. There is no poor working condition if you left stale food in your bathroom bins and leave it until the bins are full and running over you must expect to have foil smells on entering the building. The building recently passed its mold test by a company in Puerto Rico. Nothing is wrong with the building it is a hygiene problem and people are trying to sabotage Mr. Frett. I understand that the Government Admin Complex does not have sufficient space for all these other departments, so they have no choice but to rent in other places. Since they are Government Departments, why don't they send their maintenance people to check these offices? It seems like a better solution to me. Wait hold up!!!!!!!!!!!!!!!!! How is this NNP, VIP, PEP or whatever P fault. all these buildings were and still being built without proper ventilation to pull the moisture out of the buildings. The landlords are collecting rent every month. they should be forced to upgrade the buildings to prevent this mold issue. Everybody wants to have four walls with their name on it, big deal. How many more people have to suffer and die before action is taken. Look at how many people have gotten sick and die up at FSC. These building are closed up all day and night no ventilation so there will always be a mold issue.